After a relatively slow days angling at Bungsamran Lake the previous day Brendan once again returned to the public area. Brendan offered buoyant hooks popped-up 3 inches above large Fox Method Feeders packed with local groundbait. Fishing to a marginal hot spot Brendan soon began to catch small Striped Catfish to 10kg’s. A short time later a rod fished on the edge of the heavily baited area burst into life causing the angler to apply heavy side strain on the fish in an attempt to stop it entering the snags. A thirty five minute battle ensued which saw the fish heading out into the deeper water of the lake before charging back towards the snags. After a few fraught final moments at netting the large Giant Siamese Carp was finally hoisted onto the unhooking mat. 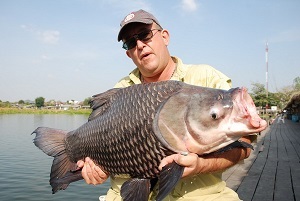 The large Giant Siamese Carp was estimated to weigh 38-40kg’s. After safely returning the fish another take on his other rod saw Brendan once again battling a Giant Siamese Carp. The battle on this occasion being a relatively short and uneventful affair seeing the fish netted within ten minutes. The fish on this occasion was observed to be much smaller than the previous carp with a weight of 23kg’s being placed on it. Local angler Wit also got in on the action and after fishing a short few hours next to Brendan managed to hook and land a small Giant Siamese Carp of an estimated 19kg’s.